One thing I love to make that I haven’t made in about a year is granola. It’s a great way to add crunch to yogurt, pancakes or to have as a quick snack. 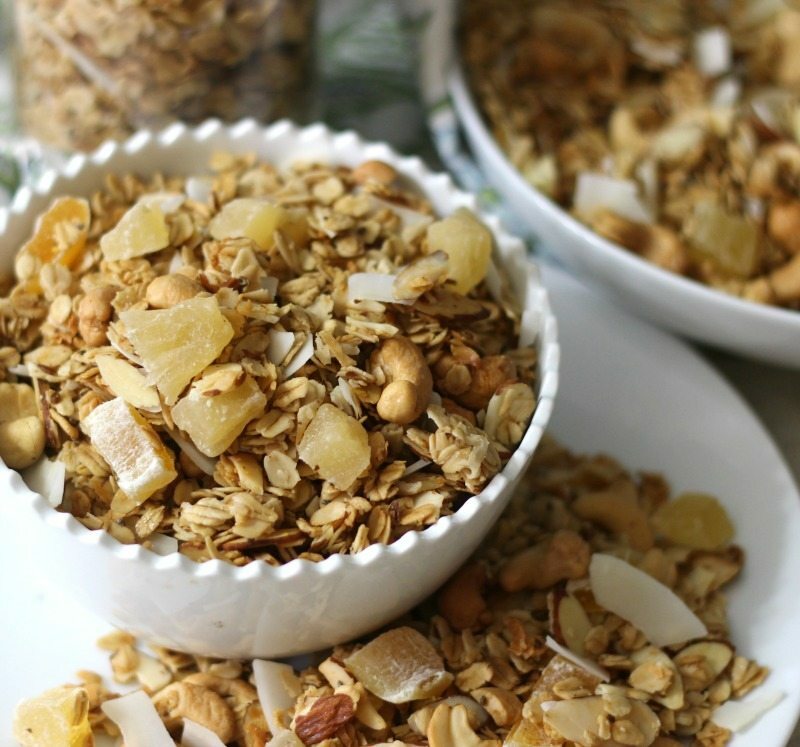 What’s great about granola is that you can use leftover nuts and dried fruit that you may have lying around the pantry. When I bake I tend to only use a half cup of nuts etc… so I always have leftovers. What is also great is that you can use any kind of nut or dried fruit you like. It’s all about what you love! For today’s granola recipe I made Coconut Lime Granola. 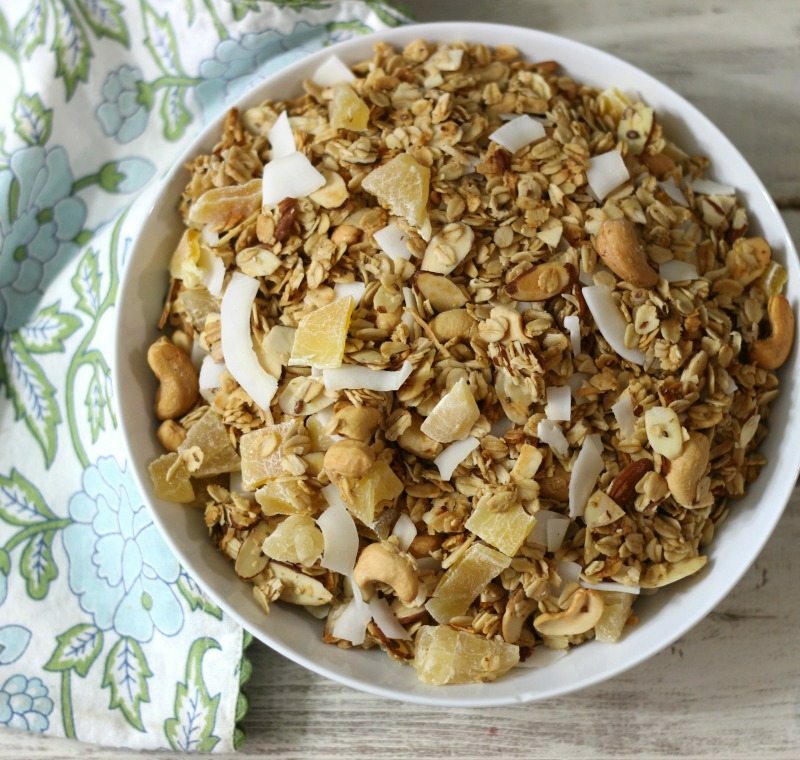 This granola is crunchy, slightly sweet and has a wonderful coconut flavor and just a hint of lime. I had key lime juice in the fridge, so I thought why not add a little bit of it to my granola for an extra punch of flavor? This granola is fabulous on yogurt. I find it very filling. When I was photographing the photos I was eating quite a bit of it. I ended up to full to eat breakfast. I kind of have a thing for granola. 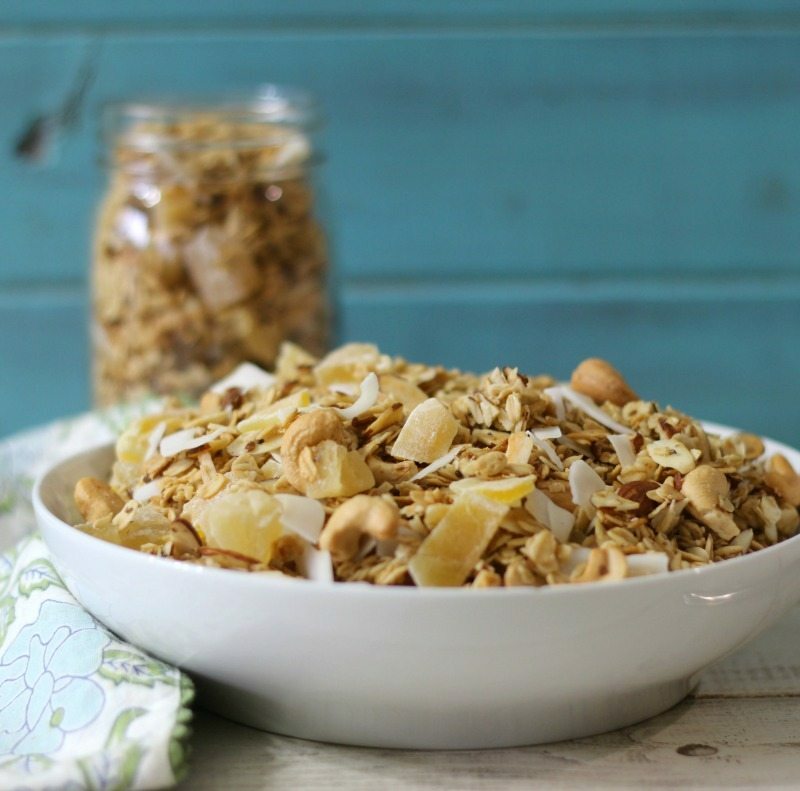 For the granola I used old fashion oats, slivered almonds, coconut flakes and cashews. I love, love, love cashews! For the wet ingredients I used coconut oil, maple syrup, coconut sugar, key lime juice and coconut extract. You just warm the ingredients in a sauce pan and pour over your oatmeal mixture. Bake in the oven for 40 minutes, flipping half way through and let the granola cool. The smell of the granola baking is out of this world. When you smell it, it’s pretty much done. Once it is cool, I tossed in more coconut flakes, dried pineapple and dried mango. Yum! 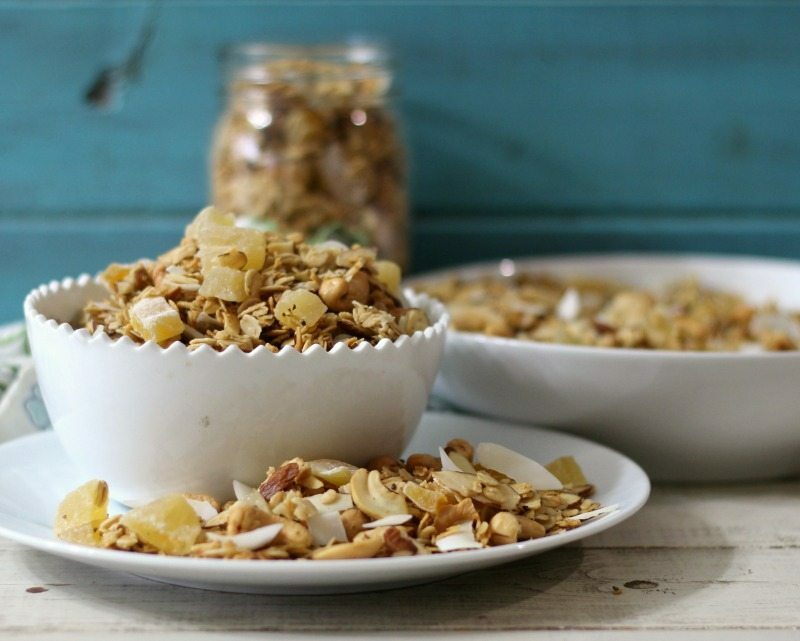 A crunchy, slightly sweet bowl of baked oats with flavors of coconut, hints of lime and dried fruit. In a large bowl; add oatmeal, unsweetened coconut, cashews, slivered almonds and flax and chia seed blend. Mix until well combined. In a small sauce pan, over low heat add coconut oil, lime juice, maple syrup and coconut sugar. Mix constantly until sugar and coconut oil is melted together. About 5 minutes. Take off heat and stir in coconut extract. Pour wet mixture, while still warm over the oatmeal mixture. Mix until well combined. I stirred for almost 5 minutes. You want everything wet. Pour onto baking sheet. Bake in oven for 20 minutes, flip, bake for another 20 minutes. Turn oven of and open the door a crack in the oven. Let the granola sit for about a half hour to dry out more. Once completely cooled, add additional coconut flakes, dried pineapple and dried mango. Store in an airtight container. You can use any kind of nut or dried fruit that you like. This recipe is so tasty and to boot it is also vegan. You can make it gluten-free by adding gluten-free oats. 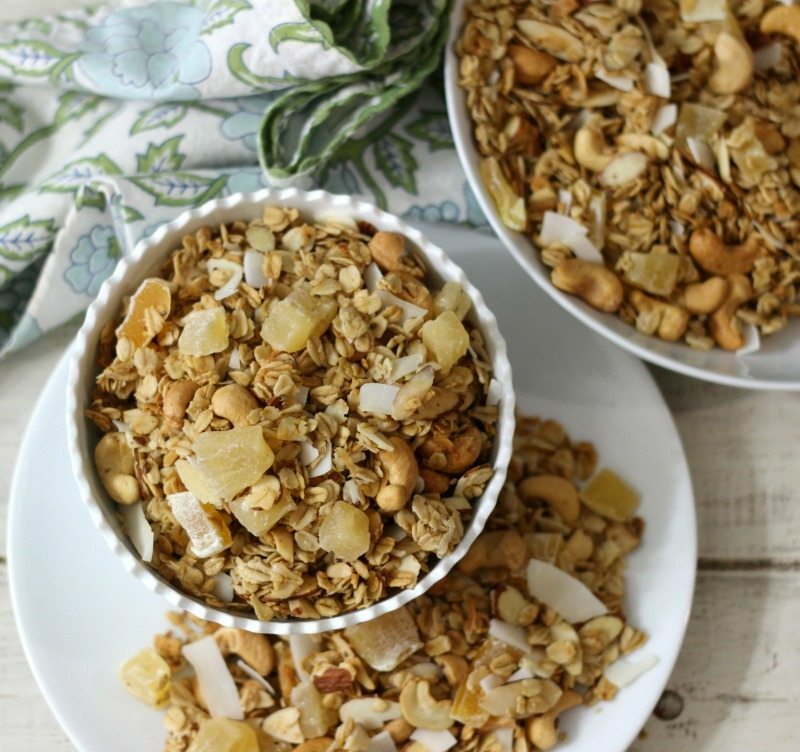 I store my granola in a canister and place in my pantry for easy grabbing. It’s so wonderful on so many things. Add some granola in your cookies, top on pancakes, pop in muffins. The possibilities are endless. You should try making granola. It’s relatively inexpensive to make and you know what ingredients are in it. Plus I think it is fun to make.